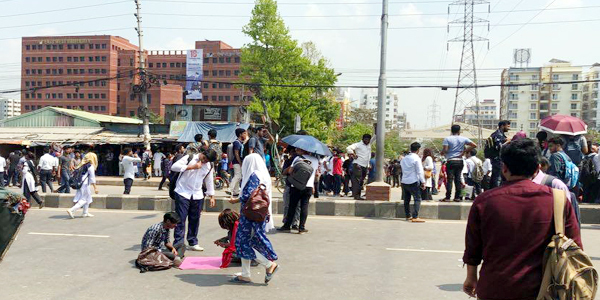 Dhaka – Several hundred students on Thursday formed human chain in Dhaka to demand improved road safety despite they postponed their mass protest until March 28. Thousands of protesters on Wednesday took to the streets after a fellow student, Abrar Ahmed Chowdhury of University of Professionals, was run over by a speeding bus on Tuesday. But they suspended the demos after the authorities assured that their demands would be met shortly. The students of different private universities stood hand in hand in front Jamuna Future Park on Pragati Sarani after police prevented them from blocking the road in the morning. The protesters said they would keep on pressing the government to accept their demands, otherwise the demands will not be respected. In 2018, hundreds of thousands of students took to the streets after two pupils were crashed by a passenger bus on Dhaka’s busy airport road. The series of protests demanding enhanced road safety lasted for more than a week from July 29 to August 8. Lax implementation of law, poor road infrastructure, reckless driving and lack of awareness by the road users put Bangladesh among countries with the highest road fatality rate. More than 7,000 people killed and over 15,000 others injured in road crashes in 2018, according to a report by civic group Bangladesh Passenger Welfare Organisation.